The TimeCutterÂ® SS5000 zero turn riding mower is powered by a 24.5 hp Toro Commercial V-Twin 708cc w/Self-Cleaning Air Filter Housing engine. It features a 50", 4" deep, high capacity, 12 ga. steel mowing deck with convenient washout port for cleaning under the deck. Comes with an 18" Thickly Padded Premium seat for added comfort. 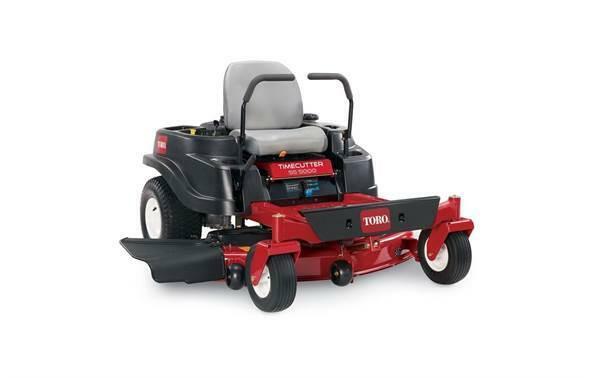 50" (127 cm) Mowing Deck: Toro's four inch deep, top discharge deck design provides superior cutting performance in all conditions. Anti-scalp wheels allow the deck to float over the turf and reduce scalping. Create your own natural fertilizer by adding a RecyclingÂ® Kit or make yard clean-up a snap with an optional Twin Bagging system.